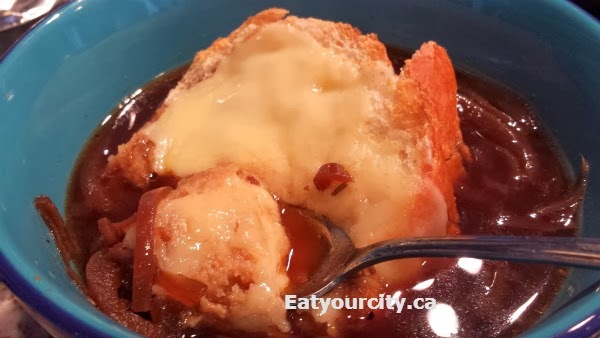 Eat Your City: Guinness French onion soup with aged cheddar slow cooker / Crockpot recipe... perfect for cold winter nights! Guinness French onion soup with aged cheddar slow cooker / Crockpot recipe... perfect for cold winter nights! Posted by I've been itching to break-in my new crockpot I picked up a few weeks ago. The biggest selling point was prep, turn it on, go to work/ go to bed and come home/wake up to a meal. So I asked my friends what their favourite slow cooker recipe was, with chicken tortilla soup and a Guinness French onion soup coming in at the top. Since I had a can of the beer kicking around (strangely, there was only one lonely can left)... it was going to be part of a yummy Guinness French onion soup recipe one of my lovely nursing friends sent me!! The onions were all soft, but still intact, the soup was on the light side for me (I may toss in some veal stock or a splash of red wine next time and maybe fresh rosemary instead of dried) but it was offset by the rich cheesey toast. Besides... melted cheese, savory onion soup and nearly zero work AND beer!? Win. Win. Win. 1) Night before you want to serve soup (or 10hrs before): Place onions, garlic, and butter into your slow cooker. Cover and cook on high heat setting for 45 minutes to an hour or until onions begin to soften. Give it a stir every now and then so you won't have random stray slices getting crispy on the sides. 2) Stir red wine vinegar, broth, beer, bay leaf, rosemary into onions. Cover and cook on low heat setting for 7 to 9 hours (or high heat setting 3 to 4 hours) or until onions are very tender. Once the soup is finished, remove the bay leaf. Salt and pepper to taste. 3) Right before serving, preheat oven broiler and set out individual slices of bread onto a baking sheet. Top bread slices with cheddar cheese and broil until the cheese is bubbly and slightly browned. Ladle soup into bowls and top with toasted 'croutons'. Serve piping hot.